We’re in the middle of a publishing revolution. Publishing houses no longer hold all of the keys to success as a writer. The world is changing. Every writer has a chance to be part of the new publishing world. This book is not about publishing contracts and million dollar book deals. This book is about creating a life as a writer. One Word at a Time is a deeply personal guide to success as a writer. Eric Vance Walton shares his hard-won lessons about creating and sustaining the writer’s life. If you want a practical and personal guide to success as a writer, this book is for you. Buy One Word At A Time in paperback and eBook formats! 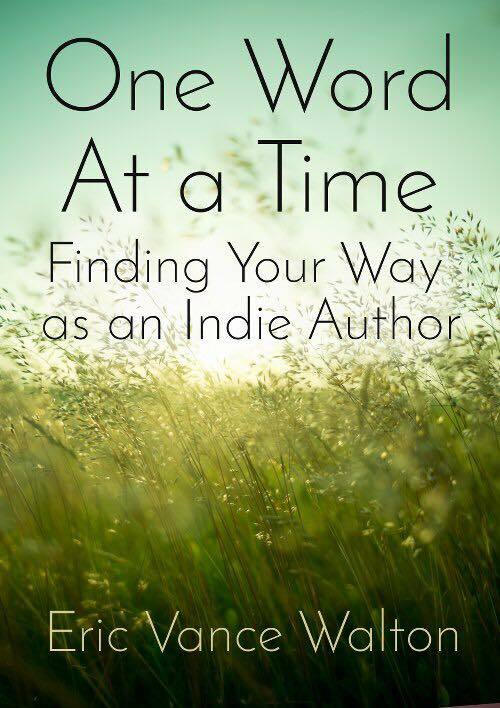 “I’ve just finished reading Eric Vance Walton’s new book, One Word at a Time Finding Your Way as an Indie Author. Eric Vance Walton, the author of, Alarm Clock Dawn, has also published a few children’s books and a few books on his poetry, for Eric is a wonderful poet. After purchasing his debut novel, Alarm Clock Dawn, I became quite a fan of his work. Eric is very loyal to his followers, and converses with them regularly on Facebook and other social media’s. Eric is always quick to respond to his followers with words of encouragement and helpful hints. If you should happen to follow his Face Book Page, every Saturday he does something called, Showcase Saturday, where he lets other writers share their writings, links to their own books, blogs, pages, and web sites. Eric also posts another fun little exercise on his Face Book page, which has become quite the favorite of mine called, Impromptu Haiku. Eric will post a Haiku and encourage others to post a Haiku of their own in the comments. “A Must Read For Beginners! – This book is well written, practical and above all else inspiring. It’s not your typical how-to book, with the facts of the craft splattered across paper in a mind numbing fashion. Eric Vance Walton breaks down the publishing industry today in an easy to read and understandable manner. It is spiritually uplifting and the more you read the more you believe in yourself. He truly is paying it forward by helping all aspiring authors to maneuver through today’s publishing world. As he paints the picture you can literally feel your confidence rise up, because he is honest in his own struggles and pitfalls. He writes with compassion and it literally felt like the book was written for me personally. For me, he simplified the steps to take to live the lifestyle of a writer and it no longer feels so daunting and out of reach. I was deeply touched and had originally purchased the book in Kindle format. However, the more I read the more I realized that this will be my go-to book and so I purchased the paperback as well that I will highlight and fill with my own sticky notes as I continue on my journey. Invest in yourself and your writing career. Purchase a copy of One Word At A Time in paperback and eBook formats. I’m thrilled the book’s helping!